Traditional cast iron casserole is perfect for slow cooking. There are two questions I often get about cooking grassfed meat. The answer to that one is very simple, I don’t. The answer is the same, but for very different reasons. Why do I not use these two modern cooking methods? The main reason is that our ancestors never used them. They used heating methods that created heat similar to that created by modern grills, and gas and electric stoves. Since my cooking is completely based on ancestral methods, you cannot get the same results with microwaves or slow cookers. But there are also other, important reasons. Microwave ovens are a relatively modern invention, never used before the twentieth century. Their main advantage is that they are easy to use, and give quick results. Many people find them very convenient and a huge timesaver. Senior housing and apartments often have no conventional ovens, just microwaves. But that convenience comes at a price. A price I am not willing to pay. Microwave ovens cook by heating from the inside out, unlike every other method of cooking food known to humanity. The heat starts at the center and moves outward, and has the effect of damaging and changing the cells that are heated. That process creates compounds never before seen in nature, known as radiolytic compounds. The process actually breaks and damages the cells while creating the compounds. Which means that our bodies have to deal with substances that are new to nature and humanity. There is much controversy over the safety and effects of microwaved food. The Soviet Union banned microwaved food and microwaves in 1976, for safety reasons. The American government, the food industry, and the manufacturers of microwaves insist that microwaved foods are safe. But the government states that microwaves should not be used for heating baby formula. As always, when you have this kind of controversy, it is very difficult to know what is true, and we all have to make our own decisions. But this area was carefully researched by a Swiss scientist named Hans Hertel. Hertel conducted a carefully controlled study which found that the blood of people eating microwaved food was changed in a negative way, one that could lead to illness. A Swiss industry organization went to court, and got a gag order which prevented Hertel from disclosing or stating some of the results of his research, so certain business interests would not be harmed. I do not know for sure which side of the controversy is right. But the very fact that this controversy exists is enough to convince me that I do not want to take the chance. Another factor is that the microwave effect of cooking food from the inside out is totally new to humanity, and I cannot believe it would work well with traditional food. Slow cookers were originally marketed with the idea that they would be an easy way to replace the iron pot that used to simmer for many hours on your Grandmother’s stove, producing all kinds of wonderful, flavorful meals. In addition, slow cookers could be turned on when you left for work, and you would come home to a wonderful dinner, ready in the slow cooker. Again, very convenient. 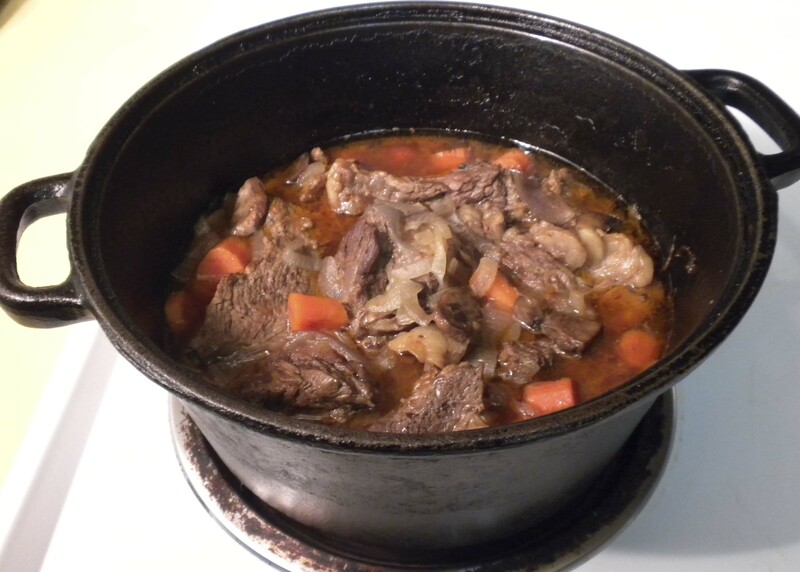 However, no slow cooker is the equivalent of the legendary iron pot that simmered for many hours on the stove. If you want to recreate the effect of that famous pot, you can put a cast iron or enameled cast iron pot in a very low oven for many hours, and you will get a very similar effect. Slow cookers are never made of cast iron, and they have a ceramic or aluminum inner pot, in which the food is cooked. Cast iron retains heat and becomes hotter as the cooking continues which causes the liquid in the pot to slowly reduce, concentrating flavors and developing them. The materials used in slow cookers do not do this, which often leads to watery sauces and a pronounced lack of flavor. While many slow cooker users have found ways to make delicious meals in slow cookers, it is not a traditional way of cooking and never was. I get wonderful results using cast iron pots, as shown in Tender Grassfed Meat. But there is another good reason why I never use slow cookers, and that is the controversy over their safety. Many slow cookers release lead or cadmium into the food. Both of these substances are harmful to humans. However, the manufacturers maintain that the amount of these substances released into the food is safe, because it is within the amounts allowed by the FDA, I have a conceptual problem with accepting that any amount of poison is safe, especially heavy metals like lead which can build up in the body. But the FDA says it is safe. Others have claimed that the lead or cadmium is sealed within the material of the pot, and never leaches into the food. Some slow cookers use an aluminum liner, but I do not want to eat anything that could have leached aluminum in it. Independent tests have claimed that lead and cadmium have leached into the food cooked in various slow cookers. Once again, it is very hard to know what is true, or who to believe. Given the controversy, I do not want to take the chance, especially when the real thing, cast iron pots, produces food that is traditional and tastes much better. This post is part of Monday Mania, Fat Tuesday, and Fight Back Friday blog carnivals. 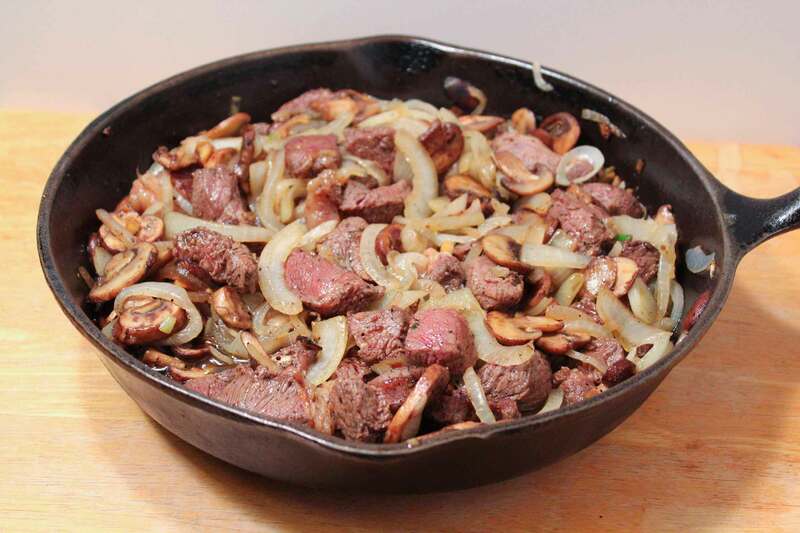 A delighful dish to savor, Stir-Fried Beef with Mushrooms and Onions, Vietnamese Style, page 124, Tender Grassfed Meat. I try to feed and nourish my family by providing the best nutrition I can. So how do we provide the best nutrition, for ourselves and our families? Many of us try to buy the very best real food we can afford. And there is some wonderful real food out there, full of taste and nutrients. 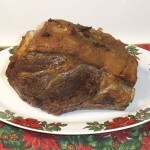 In particular, a nice cut of grassfed meat is a nutritional treasure. But buying great food is only part of the process. I have spent years learning how to cook real food and grassfed meat in particular, perfecting many traditional and delicious ways to cook it. But knowing how to cook real food and grassfed meat is also only part of the process. There is a third and vital part of the process of enjoying good nutrition, one that our ancestors knew and honored. One that has been largely forgotten and ignored in our modern world. One that takes time, but provides many benefits. One that helps our bodies absorb the nutrients in the food we eat, and aids digestion. After all, even the best food, perfectly cooked, will do us little good unless our bodies absorb and digest the nutrients in the food. That is the old custom of savoring the food we eat, as we eat it. Savoring food can best be described as the practice of eating slowly, chewing the food thoroughly, taking small breaks from eating to talk and enjoy the companionship of the table, and giving full attention to how delicious the food tastes as we eat it. Doing this is one of the greatest pleasures in life, when you are eating good food. Savoring food is the opposite of what so many people do at mealtimes, which is to give a chew or two, gulp down the food as fast as possible, and have a short, hurried meal, usually thinking about anything other than the food that is being eaten. Not only is the modern fast meal stressful, it has a very bad effect on our ability to absorb the nutrients in the food we eat, and can lead to a host of digestive difficulties and even disease. A wonderful benefit of savoring food is the great taste sensation. When we obey the laws of our own bodies, we are often rewarded by feelings of enjoyment and pleasure, which are great to experience. I contend that the full taste of even the most delicious food is not enjoyed unless the food is slowly and thoroughly chewed, with attention devoted to how good it tastes. It is then that you get the full enjoyment of the wonderful tastes of perfectly cooked grassfed meat, or other real food, which is a true pleasure. Many subtle nuances of taste and texture appear that are not noticed if you just gulp the food after a fast chew or two. I am convinced that the pleasure obtained from savoring wonderful food also helps our digestion and absorption, as the natural processes of our bodies always work better when we are happy and relaxed, and enjoying ourselves. Another huge benefit of savoring food is to start the digestive process as we chew our food. The saliva in our mouth contains digestive enzymes which are meant to mix with the food and start the digestive process. Gulping food prevents this natural and vital process from taking place. Our digestive systems were not meant to break down big chunks of gulped food, and have a hard time doing so. Gulping down chunks of food can actually result in choking, and people have actually died from it. Slowly chewing each bite of food until it is broken down into small easily digested pieces presents the food to your digestive system as it was intended to receive it, which greatly increases the absorption of nutrients and aids digestion. The slow and thorough chewing of food also allows the enzymes in your saliva to mix with and predigest the food, which also helps the process. Some nutrients are absorbed directly through the mouth in this process. 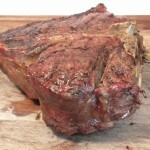 When I chew a bite of grassfed steak into tiny shreds, I get a wonderful feeling of contentment and satisfaction, as my body absorbs some of the nutrients. Taking small breaks from eating to talk also helps the digestive process, as it gives time for our bodies to process the incoming food at a natural pace. There is a third major benefit, one that will appeal to many. When you slowly and thoroughly chew and swallow your food, you are getting more nutrients, which means you are satisfied with less food, and will naturally eat less. The very process of thorough chewing takes time, and this also seems to reduce the appetite. The opposite is also true, as when you gulp down barely chewed food, you do not get the nutrients that are normally absorbed in the mouth, and the difficulty of breaking down the chunks means your body takes much longer to get the nutrients, which makes you want to overeat. In other words, savoring your food can help you lose weight. The fourth major benefit is one most people never think of, but is important. Our bodies are not designed to gulp big chunks like a snake, but to digest thoroughly chewed food. If you gulp food, your teeth and jaws are not being used the way nature intended, which weakens not only the muscles, but the bone structure of your teeth and jaws. Thoroughly chewing food gives your jaw and mouth muscles the exercise they need, and this exercise helps make the bones in this area stronger as well. When enough food was available, many of our ancestors would enjoy meals served in many courses, eaten slowly. Dinners like this could easily take hours. In fact, eating long, slow dinners has been an honored tradition in relatively modern times, especially in France, Italy, and Spain, and many other countries. Very often the first course served would be a soup, usually made with rich broth, which is known to aid the digestion of more solid foods. Many cultures would have soup available throughout the entire meal, for the same purpose. In Western cultures, people were expected to be relaxed and friendly at the dinner table, avoiding controversial subjects, because it was known that peace and relaxation aided the digestive process. The order in which various foods were served was based on tradition and experience, and a whole evening could be spent eating such a meal. Our ancestors might not have understood exactly how our organs and natural functions digest food, but they certainly understood what aided digestion. But What Can We Do in Modern Times? The sad truth is that most of us are so busy that we just do not feel that we have the time to cook, let alone eat a long meal with distinct courses. Many people quickly gulp down factory food for most of their meals, never realizing what they are missing and how this hurts their bodies. No wonder drugs to deal with stomach and digestive problems sell so well. Even if you have real food, gulping it down is a real disadvantage. I would like to say that I have plenty of time for each meal, but I do not always feel that way. So I have reached a compromise, which is to purchase the best real food, especially grassfed meat, that I can afford, carefully prepare it, and serve a nice variety of food at once, including broth. I will take the time to thoroughly chew each piece of food, especially meat, until it has been reduced to shreds. I will swallow it slowly, no gulping allowed. I must confess that this does make meals take longer, but the rewards are immense. And I must confess that sometimes I do not follow my own rules and eat too fast, especially when time is short. But the more I take the time to savor my food, the better I like it. A steak fit for champions barbecued by me. As food becomes more and more industrialized, we are losing our food traditions. Take one of the most cherished cuts of beef in human history, meat cut from the chine portion. This meat was so valued in ancient times that it was reserved for the most important members of society, the champion warriors. The Iliad, perhaps the oldest European literary work, tells of how mighty Achilles, the greatest champion of them all, barbecued meat from the chine for the kings and heroes of Ancient Greece, on the beach of Troy. Old Irish stories, passed down orally for hundreds or even thousands of years before being written down, tell of fights to the death between heroes for the right to claim the chine, known as the Champion’s Portion. The chine portion was believed to give strength and courage, and build up the muscles a champion would need to swing his sword during a long battle, or to rebuild his body after it was bruised and wounded. In more modern times, this honored cut was known as prime rib by the English, entrecote by the French, and Bife de Ancho by Latin Americans. Whatever it was called, it was an expensive, honored cut, favored and enjoyed by those who could afford it, or as a special, holiday treat by those of more modest means. In our time, most people do not even know what it is. The chine portion of beef is usually cut completely from the bone and trimmed of all fat in a meat processing plant, then sold in a vacuum pack to supermarkets, where unskilled employees cut it into thin, boneless, fatless portions that no hero would ever have recognized. Most of this meat is a product of the feedlot, which gives it a taste that no hero would want. The tradition is fading away, but I celebrate it from time to time, as a very special treat. 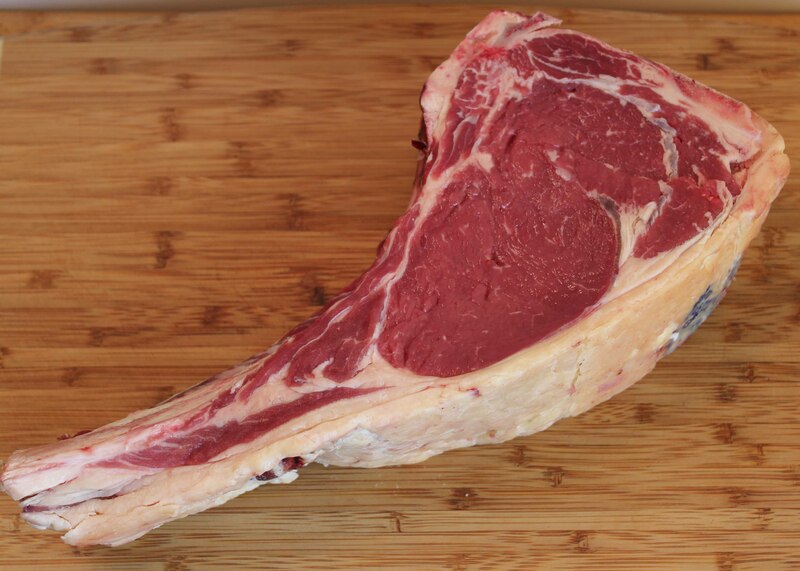 This magnificent steak was cut by skilled butcher Brian Chavaria. If you have never seen a true steak cut from the chine, behold the raw meat in this photo. This is a classic steak from the chine, with all its components. It contains both the long rib bone and the short, flat chine bone at the top. Note the thick rim of glorious fat, the beautiful red color of the grassfed meat. See how thick it is. The chine bone gives a particular, incredible flavor to the meat, and the rib bone contributes another. 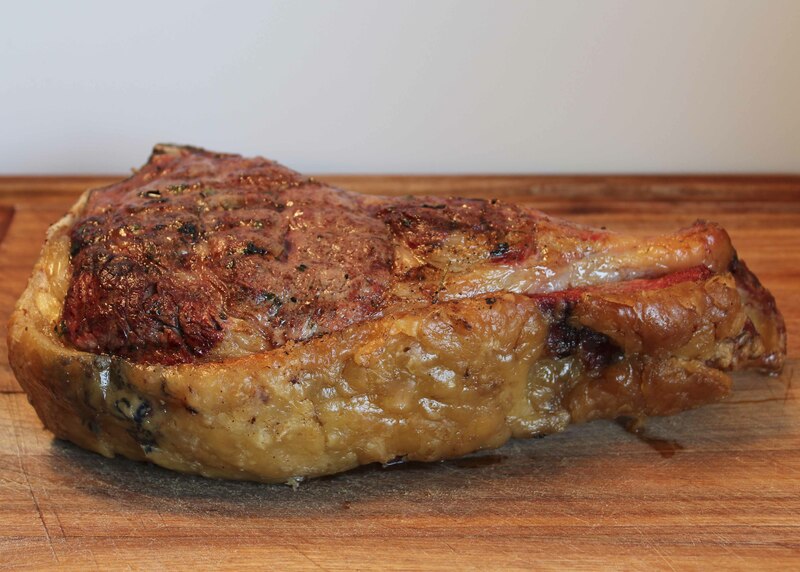 The thickness of the steak allows it to cook long enough to fully develop its incredible natural flavor, especially when cooked in front of a real fire. The fat bastes the meat as it cooks, adding yet more flavor and tenderness. When the meat is done, the nourishing grassfed fat is crisp and delicious on its own, especially when served hot. Meat like this needs little in the way of spices, merely a cook who knows how to cook grassfed meat. This magnificent steak was cooked in front of a fire, hot at first, then cooler, in the old way. The cooked chine steak is shown in the photo at the top of the page. Achilles and the Irish heroes would have recognized it by sight, and by the glorious meaty smell. I cannot show an aroma in a photo, but I can tell you that my mouth watered when the smell of the perfectly barbecued meat hit my nostrils, and I became very hungry indeed. The flavor of the fire provided the perfect enhancement to the tender red meat, and every bite was like tasting poetry. The unique flavor of this cut, available nowhere else, came through as well, and added to the enjoyment. A steak of this size will feed several people. This grassfed steak, dense with the nutrients of the bone and the fat cooking into the meat, is very satisfying and filling. The feeling of sheer satiation and contentment I felt after the meal was a joy to experience. And I did feel stronger and refreshed. I understood why this cut was so prized for thousands of years. 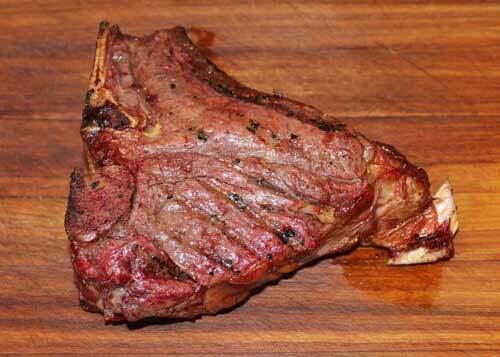 For a steak like this, you need grassfed meat, from a healthy cow finished on rich green grass. But it is also important to have it cut properly, and only a butcher who knows the old art of his craft will know how to do this. This mighty, magnificent steak was cut by Brian Chavaria, a skilled butcher who knows his craft and appreciates the magic of great meat. The chine steak is a tradition well worth preserving. This post is part of Monday Mania, Fat Tuesday, Real Food Wednesday, and Fight Back Friday blog carnival.